Do you remember the R8 Racing Edition Anderson Germany unveiled last year? Well, the tuning firm is back with that same package, but this time, they’ve applied it to an even cooler model. 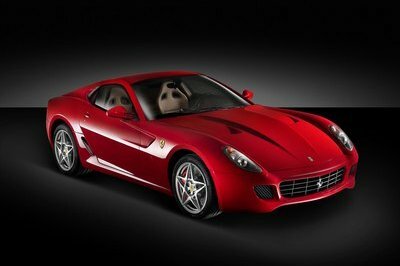 The Ferrari 599 GTB Fiorano Race Edition by Anderson Germany will be defined by the same black exterior and black/red interior, as well as a 30 HP engine upgrade. The package starts off with a body kit offered by Hamann, and then gets a new set of 21" wheels and a matte black wrap with an elegant red border. That same black and red treatment continues on the interior with black carbon fiber inserts on the door trims, radio frame, ashtray, gear stick frame, hand brake knob, and steering wheel. The black components are then highlighted with different red edges. After that sleek and classy aesthetic look is taken care of, Anderson Germany then puts in a new exhaust system by Hamann and a six-liter V12 engine that has been tricked to deliver a total of 650 HP (up from 620 HP). Described in one word, this car is simply AMAZING. Honestly, I don’t like the gray and red theme for the interior but black and red looks good in the exterior. BTW, the boost power on the engine sounds great and if not mistaken 10 added horsepower will be more likely the same with the power output of Ferrari FF. Oh yeah! This version is cooler compare to Audi’s edition. I think they have upgrade the engine from v10 to v12. I bet this one would be more powerful. BTW, aesthetic was good also. Well, I do agree with you, the exterior does help get people interested in the car. But in order for them to be really into a ride, it must have good performance. Maybe because they focused more on upgrading the engine performance rather detailing the exterior. BTW, i have to agree that good exterior makes a good impression for the car. There isn’t that much boost in the engine’s output, but that’s not really a concern. With that kind of exterior, the car w3ould seem to go faster even if doesn’t. there is a lot of change with such simple changes to the exterior, and why can’t the designers at Ferrari thought about it and how could they miss it? Well, the tuning job is real cool and creative. Well, I also don’t like the design of the Fiorano that much. But this one is certainly a looker. Qanderson Germany really did a great job in improving the looks of this. Well, I must admit that the Fiorano is really one of the few models in Ferrari’s that I really don’t like a lot. But this paint job certainly made this one a stunner. True. with more than 600 HP, along with such exteriors, the car is going to win hearts. It will surely make its mark when it is spotted racing ferociously which cannot be missed with its dashing black and red looks. Ferrari 599? Is this the successor of the Ferrari 458? Well, i think the bonnet looks like a Porsche. However, It think those rims are cool but look so cheap with the full leather material used in the interior. This one kinda feels like Knight Rider with all that black and red accents. It’s definitely a car that David Hasselhoff will be proud off. Truly amazing. What a sight, the elegant color, the finishing and not to mention the performance, undoubtedly the best racing car with looks and performance. Love to own such a car.